I expect we all have a Robin Redbreast in our gardens or around our homes. but particularly in our gardens. I’ve lived in the same house for nearly 35 years now and we’ve always had a Robin bobbing around the place. A regular sight in my garden in the Autumn and Springtime is a Robin perching on the handle of my shovel. Have we had the SAME Robin for all those years – probably not. But I’ve never seen this Robin hatching from an egg and I’ve never ever seen a dead Robin, so why not the SAME ROBIN for all those years ? Why not? 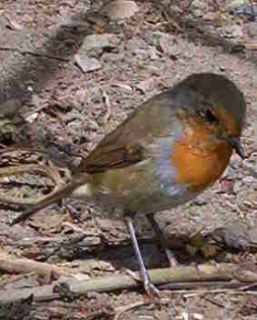 I remember as a child my Mum leaving scraps out for the birds and I particularly remember the Robin visiting the windowsill – I remember too my Mum telling me of the story of how the Robin got its Redbreast – something to do with keeping the last embers of life in the world alight. Maybe it was a metaphor for something or other? But things changed and when Mum moved away there wasn’t anything on our windowsill for the Robin or any other bird for that matter. Indeed the hunger in us was so bad that I used to “raid” other windowsills just for food for myself and my brother. I remember chasing these birds away so I could get at the rasher rinds and the crusts of bread that were left out. Hunger does that to you. You steal from smaller things! Naturally the “authorities” got to hear of this and we were all carted off to Court and placed into the tender mercies of the Sisters of Charity. You’d think that things would improve a bit because of this but no, they didn’t. Many of the beatings I got in my early days with the Sisters of Charity was to do with “food raids” – there was many a time I chased birds from the windowsills of the convents kitchens to get at the scraps left out for those birds. Sometimes I would lie quietly under the windowsill so as to be first to grab the delights being placed there. A few of those times a Robin would actually perch on my shoulder so he/she would be first in the queue! 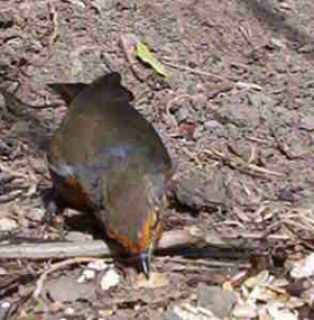 Of course when I made my grab for the food the poor Robin would fly away. I’ve always felt a twinge of guilt over depriving this Robin of his chance at the feast – I’ve never forgotten the awe I felt that a bird would perch on me. Amazing feeling really. And now I have a Robin in my garden just like I’ve had a Robin in the back of my mind for years. Like us all, I’m sure, I put food out for the birds, particularly during hard frosts and maybe throughout the year …. I have four bird feeders placed around the garden and in winter these are kept topped up. And these are visited regularly by all kinds of birds …. only recently I saw a Heron at the bottom of the garden – – there is a swamp/bog behind us so Herons are occasional visitors in the area. But the Robin is the constant bird in my garden. So last week I was bringing a fistful of muesli down to one of the feeders when I noticed the Robin perched on the hose – I offered the Robin my open palm with some of the muesli in it. The Robin alighted onto my hand and proceeded to feed. I went into some kind of hypnotic state and basically froze while the Robin cleared my hand of the muesli. I’m a bit of a camera buff and an opportunity like this would be something I would pray for BUT that is not what went through my mind. I felt that this Robin was forgiving me for all those many many times that I had take food from them when I was a child. I have tried since to repeat this but with a camera – but to no avail. Maybe forgiveness is given once – because once is enough.